Members of the graduating class of the Virginia Bankers School of Bank Management present donations to VIA. From left: Josh Toth, Burke & Hebert Bank; Megan Greenwood, Virginia Institute of Autism; Keith Smith, Village Bank; Scott Griffin, Skyline National Bank; and Bethany Bajsert, C&F Bank. The Virginia Bankers School of Bank Management graduating class of 2018 presented more than $4,600 to Project Lifesaver and additional monies and supplies to Virginia Institute of Autism. The funds and donations were raised this summer through a collaborative effort organized by the graduating class and in cooperation with the other 189 bankers in the Virginia Bankers School of Bank Management. Project Lifesaver is the premier search and rescue program operated internationally by public safety agencies. The primary mission of Project Lifesaver is to provide timely response to save lives and reduce potential injury for adults and children with the propensity to wander due to a cognitive condition. The Virginia Institute of Autism is dedicated to helping people overcome the challenges of autism through innovative, evidence-based programs in education, outreach and adult services. The majority of the funds were raised for Project Lifesaver through students’ participation in a bowling fundraiser event at AMF Kegler’s Lanes in Charlottesville. 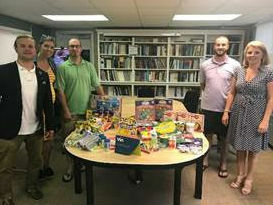 This year, the graduating class also coordinated a supply drive based on the VIA’s wish list, and students donated items including stuffed animals, and art and cooking supplies. Each graduating class of the Virginia Bankers School of Bank Management selects a charity to support during their final year of the program. Past charity recipients include UVA Children’s Hospital, Blue Ridge Area Food Bank, Special Olympics Virginia, the RocSolid Foundation, the Virginia Wounded Warrior Program and the Juvenile Diabetes Research Foundation.